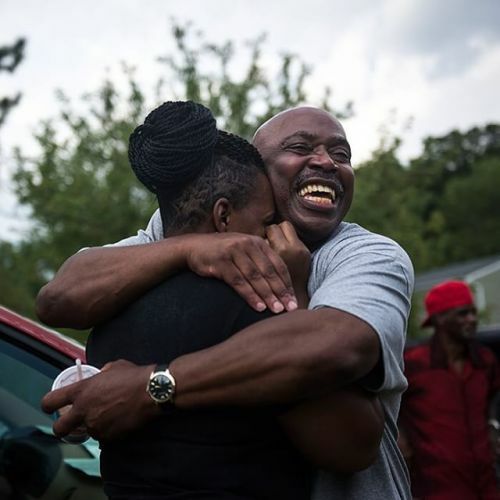 “Rudolph Norris, 58, hugged his niece Janice in Upper Marlboro, Maryland. Two weeks ago, Rudolph walked out of Morgantown federal prison carrying the letter that had set him free after 22 years behind bars. “Dear Rudolph,” it began, “I wanted to personally inform you that I have granted your application for commutation.” The signature: “Barack Obama.” Rudolph was one of 22 federal prisoners released on July 28 through a push to shorten sentences for nonviolent drug offenders who received punishments far lengthier than they would have drawn today. For all of them, there are challenges ahead. “As I navigate my way back to society and begin a productive life,” Rudolph wrote to @barackobama in response, “one of the first and foremost thoughts on my mind will be my solemn commitment to prove to you that your faith in me was not at all misplaced.” Photo by @gdemczuk.” By nytimes on Instagram.